The Yamaha PSR EW300 76-Key Portable Keyboard Bundle has a 76-key touch sensitive keyboard, and is designed for intermediate piano players who have outgrown a beginner, 61-key keyboard and want a wider range of notes, tones, capabilities, and expressions. It has excellent built-in learning functions and a big suite of digital effects, to take your piano playing to the next level. Who is the Yamaha PSR-EW300 SA Most Suitable For? What's Included With the Yamaha PSR-EW300 SA Bundle? While 61-key keyboards are a great way to start learning the piano, and are lightweight and portable, as a player progresses, eventually they want to have a greater range of notes and chords at their fingertips. For intermediate learners, a 76-key keyboard enables greater exploration and expression, without the weight and bulk of a full-size 88-key keyboard. The Yamaha PSR-EW300 SA was introduced last year as an update to their popular YPG235 model, with upgraded features and a new look. The YPG235 is widely praised by music lovers and piano experts alike, and the PSR-EW300 continues the famous Yamaha quality and sound in a new model. The Yamaha PSR-EW300 SA 76-Key Portable Keyboard Bundle is designed for intermediate piano players and aspiring musicians who want a greater range of notes, chords, and tones than they can achieve with a small, 61-key keyboard. It's perfect for students who have outgrown their smaller keyboard, and want to further progress and challenge themselves with their playing. It is also an excellent choice for completely new players, with all the Yamaha educational and learning features of their smaller keyboards designed for novices. The automated accompaniment capabilities and intelligent action of this keyboard will have even beginners playing complete songs in no time. 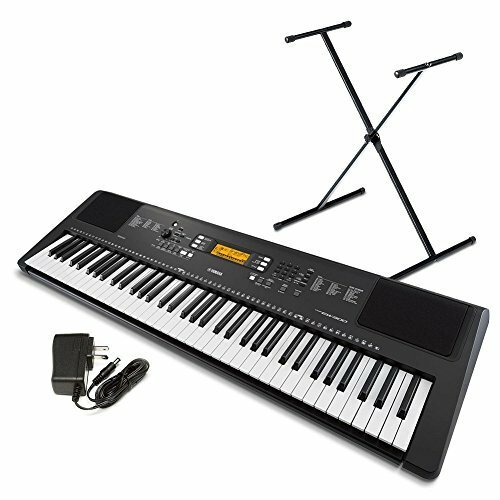 The Yamaha PSR-EW300 SA 76-Key Portable Keyboard Bundle comes with a detachable music rest, a power supply, and the PKBS1 keyboard stand. 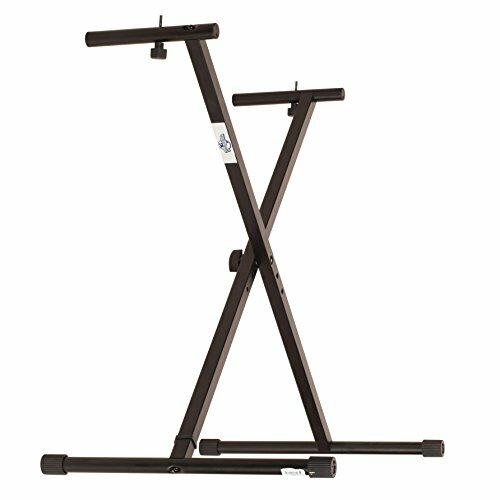 This X-style keyboard stand folds into a slim footprint for travel or storage, with durable construction and non-slip rubber feet for stability. It has a circular locking mechanism and a quick-change knob to adjust to six different playing heights, from 25.63” to 38.75”. It can be used to play the keyboard seated or standing, and weighs just 6 lbs. The Yamaha PSR-EW300 SA 76-Key Portable Keyboard Bundle is packed with features in a compact footprint. 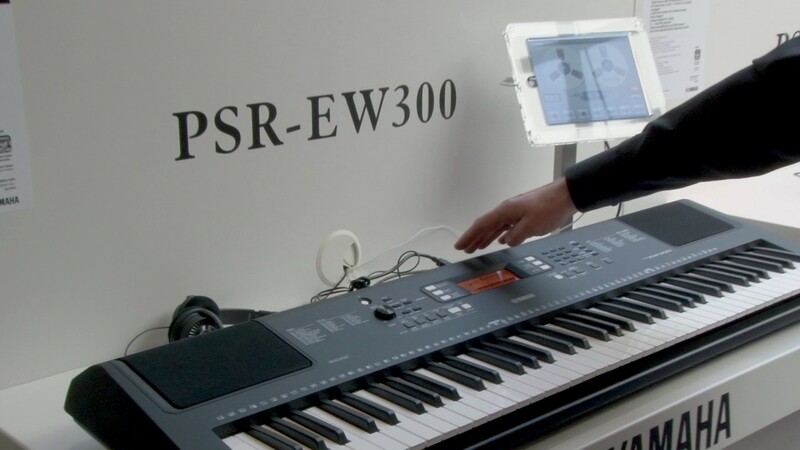 The Yamaha PSR-EW300 SA keyboard weighs less than 14 lbs. without batteries. 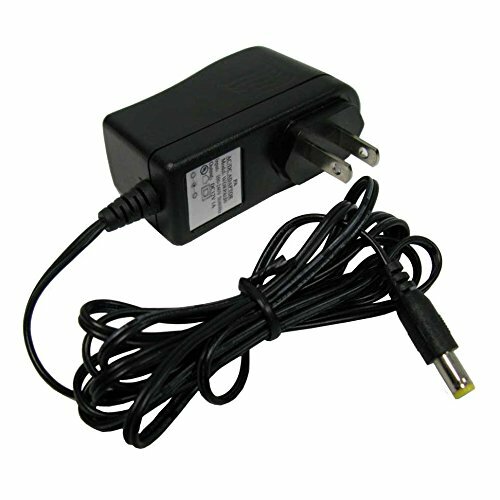 The ability to play with AC or with battery power helps the portability of this keyboard, which can be easily taken outdoors to play, travel with a family, or go to and from practice. The onboard buttons and menus are clearly labeled, the backlit LCD screen is easy to read as it guides you through settings, functions, or piano lessons. The Yamaha PSR-EW300 SA is driven by the famous Yamaha AWM stereo sampling sound engine. It's not Yamaha's best grand piano sound, but is an excellent sound engine that makes Yamaha beginner keyboards preferred by experts. It has duo, split, and keyboard functions, so you can share the keyboard with another player, or produce multiple instrument voices with every touch. Transpose and tuning functions allow you to adjust the instrument to your preference, particularly when playing along with other instruments or vocalists. A library of 165 musical styles and style controls, including auto fill and other options, allows you to explore any music style you choose. The Melody Suppressor feature can suppress the vocals on tracks when they are played through the keyboard, allowing you to play or sing along without competition. The included Yamaha Education System has a number of capabilities to help new piano players learn and grow. With the downloaded song book, you can read music and play along with the onboard songs in the keyboard. It has easy, step-by-step lessons and practice, along with “touch tutor” lessons for learning dynamic expression. The education system will also track and grade your lessons as you progress. It has 76 touch-responsive keys, which play with louder volume depending on how hard the keys are pressed, just like an acoustic piano. It comes with the necessary power supply, and a slim, adjustable, x-style keyboard stand, so you can begin playing right out of the box. It comes with a whopping 574 total instrument voices, with 197 panel voices, 18 drums and effects, 20 arpeggio, and 339 XGlite voices for a huge range of sound capabilities. With 154 preset songs and 165 preset styles, it has everything you need to learn and play nearly any type of music. It has a large range of reverb, chorus, harmony, and EQ settings for customizing your sound, and 48 levels of polyphony allow for complex, overlapping, nuanced music. Registration buttons, one-touch setting, and grand piano button allow you to not only customize your settings as you prefer, but quickly store and save them, or immediately return to the factory default with grand piano. Built-in arpeggio and a number of arpeggio styles and options adds even more capabilities for musical styles and sounds. When the Yamaha PSR-EW300 SA is idle for a while, it will automatically power off, saving your battery life or energy costs. The Yamaha PSR-EW300 SA has headphone and pedal jacks, as well as AUX IN to connect a music player, and USB to host for connection to computers and mobile devices. Dual, split, and duo keyboard functions allow you to share the keyboard or produce multiple instrument sounds at once. 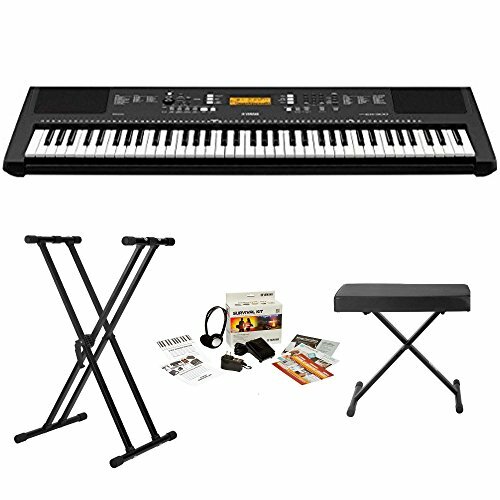 With 76 non-weighted keys, the Yamaha PSR-EW300 SA 76-Key Portable Keyboard Bundle is an intermediate keyboard, and, as such, represents a decision point in a musician's interests and aspirations. While it is a friendly and easy-to-learn keyboard for absolute beginners, it is intended to be an upgrade for those who have learned the basics of playing piano on a 61-key keyboard, and now want greater range, greater possibilities, and greater capabilities in their instrument. For those who want to go on to play acoustic, grand pianos in the future, or who are practicing at home and taking lessons or performing on analogue pianos, the Yamaha PSR-EW300 SA actually isn't the best choice. Once a beginner has learned the basics of piano playing on a 61 key keyboard, it would be better to progress to a full-size, fully weighed keyboard, so that their digital practice sessions build the finger strength and technique they will need on an acoustic piano. For those who want to play a concert piano in the future, a better choice would be to invest in the Yamaha P71 88-key Weighted Action Digital Piano. 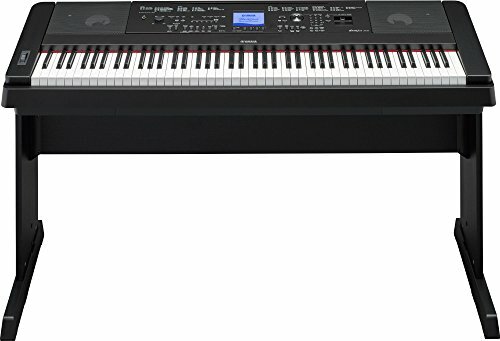 The P71 has the same great Yamaha AWM sound engine as the PSR-EW300, and a broad range of instrument voices and advanced settings, but has the crucial full size keyboard and fully weighted keys that will make the most of every practice session, and open up the full range of piano compositions and musical expression for the student. 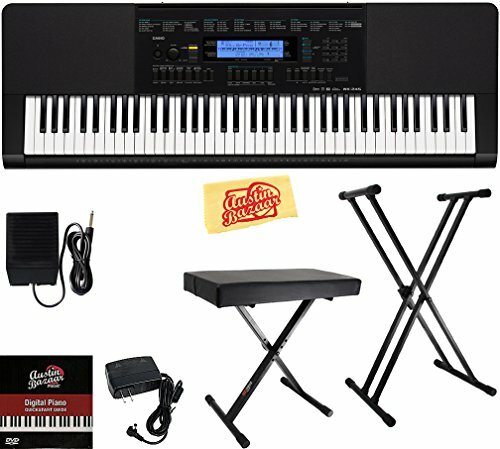 For those aspiring musicians who are familiar with a 61-key keyboard, and want to grow both musically and professionally, a good alternative to the Yamaha PSR-EW300 SA 76-Key Portable Keyboard Bundle might be the Casio WK245 PPK 76-key Premium Portable Keyboard Package. Like the Yamaha PSR-EW300, the Casio WK245 has 76 keys and comes with an easy, step-by-step lesson system. However, the Casio has a greater range of instrument voices, digital features, and has much more robust onboard recording, mixing, and sampling capabilities for a musician who wants to not just learn, but to record, compose, and share their music. All three of these instruments are very good choices for intermediate musicians, but it's helpful to identify whether you are playing the digital piano just for fun, or intend to grow into a concert pianist, or intend to start your own band. Knowing your goals will help an intermediate player make the digital keyboard upgrade that is best for them. The Yamaha PSR EW300 SA 76-Key Portable Keyboard Bundle is a great instrument, designed for intermediate learners. 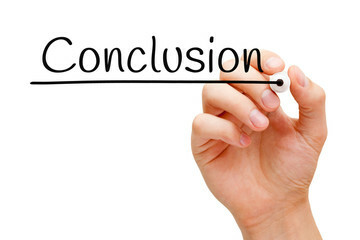 However, it's not the perfect choice for all intermediate learners; those who want to transition to an acoustic piano should also transition to a full-size weighted keyboard sooner rather than later, so that their practice time is more meaningful. For piano beginners, casual players, and digital musicians, the Yamaha PSR-EW300 is an excellent choice. Yamaha P45B Digital Piano Reviews (2018): Is It Worth Your Money?